Full length protein corresponding to amino acids 1-205 of Human TC10 (NP_036381.2). TC10 transfected 293T cell lysate. HeLa cells. Our Abpromise guarantee covers the use of ab168645 in the following tested applications. Plasma membrane-associated small GTPase which cycles between an active GTP-bound and an inactive GDP-bound state. In active state binds to a variety of effector proteins to regulate cellular responses. Involved in epithelial cell polarization processes. May play a role in CFTR trafficking to the plasma membrane. Causes the formation of thin, actin-rich surface projections called filopodia. May be post-translationally modified by both palmitoylation and polyisoprenylation. 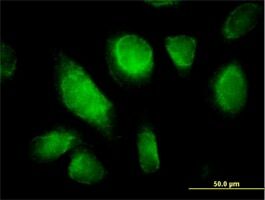 Immunofluorescence analysis of HeLa cells, labeling TC10 with ab168645 at 10 µg/ml. Publishing research using ab168645? Please let us know so that we can cite the reference in this datasheet. There are currently no Customer reviews or Questions for ab168645.